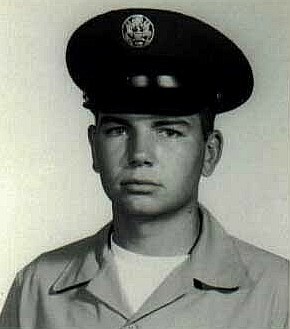 Charles Frederick Fenter was born on October 1, 1953 and joined the Armed Forces while in Tucson, Arizona. He served in the United States Air Force and in one year of service, he attained the rank of Master Sergeant. 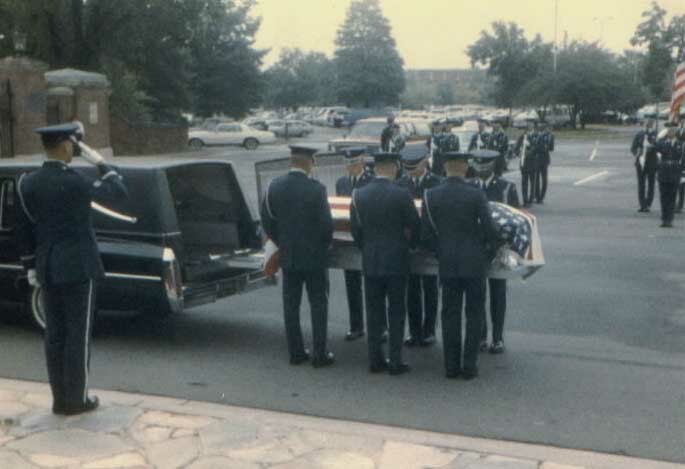 On December 21, 1972, at the age of 19, Charles Frederick Fenter perished in the service of our country in Laos. Rollie Reaid; George D. Macdonald; John Winningham; Francis Walsh; James R. Fuller; Robert T. Elliott; Robert L. Liles; Harry Lagerwall; Paul Meder; Delma Dickens; Stanley Kroboth; Thomas T. Hart (all missing); Joel R. Birch (partial remains recovered); Richard Williams and Carl E. Stevens (rescued). weapon for interdicting enemy traffic along the Ho Chi Minh Trail. On 21 December 1972, the crew of a Lockheed AC130A gunship named "Thor," tail number 56-0490 and call sign "Spectre 17," departed Ubon, Thailand on an interdiction mission to interrupt enemy movement along the Ho Chi Minh Trail in Laos. Its crew of 16 was comprised of Captain Harry R. Lagerwall, pilot; Major Francis A. Walsh, Jr., fighter pilot who was listed as an additional crewman for this mission; Captain Stanley N. Kroboth, co-pilot; then Captain Thomas T. Hart III, table navigator; Technical Sergeant James R. Fuller, flight engineer; Technical Sergeant Robert T. Elliott, aerial gunner; Airman First Class Charles F. Fenter, aerial gunner; Airman First Class Rollie K. Reaid, aerial gunner; First Lieutenant George D. Macdonald, sensor operator; First Lieutenant Delma Dickens, sensor operator, First Lieutenant Robert L. Liles, sensor operator; Major Paul O. Meder, infrared sensor operator; Techanical Sergeant John Q. Winningham, illuminator operator; Technical Sergeant Carl E. Stevens, illuminator operator; Technical Sergeant Richard Williams, aerial gunner; and Captain Joel R. Birch, sensor operator. With the exception of Major Walsh who was a member of the 497th Tactical Fighter Squadron, all members of this aircrew were assigned to the 16th Special Operations Squadron. Both Squadrons were stationed at Ubon Airbase, Thailand. During the flight to the target, Spectre 17 inexplicably broke altitude descending to a lower level according to crewmen aboard other gunships taking part in the same mission, and was hit by enemy ground fire. After evaluating the amount of battle damage sustained by Thor, the decision was made to attempt to return to base. After 10 minutes of stable, level flight, fuel accumulated ankle deep in the cargo area igniting an explosion that severely damaged the aircraft, but did not cause it to disintegrate. According to reports provided by other aircrews who monitored radio communications between the crew of Spectre 17, along with communications between aircraft, none of the 16 crewmen were injured by the ground fire that initially damaged the gunship. The crewmen were preparing for a possible bailout by putting on their parachutes, and those men not necessary for flying it were moving to the rear of the aircraft. The jump bell was heard over the headsets of those monitoring communications between the aircraft 5 to 10 seconds before Spectre 17 exploded. Further, once the men hit the ground, many emergency beepers were heard "going off all over the place." Technical Sergeant Richard Williams parachuted just before the explosion and Technical Sergeant Carl E. Stevens did the same immediately afterward. Both men evaded enemy patrols and were rescued hours later. According to U.S. intelligence reports that vary somewhat in content in as much as each gives bits and pieces of the story, once Carl Stevens and Richard Williams were rescued - and within 24 hours of the incident - the crash site was visited by either friendly indigenous forces and/or a US Search and Rescue (SAR) team who found and photographed 2 piles of bloody bandages and 5 deployed parachutes. The partial remains of Captain Joel R. Birch, which consisted of part of one arm and hand, were recovered and these "remains" were later identified through fingerprints. He was listed as Killed in Action/Body Recovered because of this positive identification. Other than Technical Sergeant Stevens and Technical Sergeant Williams who were rescued, no other crewmen could be located. Based on the physical examination of the crash site, Thor cut a path of destruction through jungle vegetation, which is consistent with a long, horizontal glide flight path to the jungle floor rather than a crater/hole in the jungle floor caused by a relatively vertical, rapid decent. The crash occurred in the rugged jungle covered mountains just a few hundred meters from the village of Nong Song Hong, Champassak Province, Laos; approximately 13 miles due east of Xe Don Lou River, which empties into the Mekong River on the west side of the town of Pakse, some 25 miles southwest of the crash site. According to a 1973 Defense Intelligence Agency (DIA) intelligence report, in early 1973, a US satellite photographed the roughly 10-foot high numbers "1973" or "1573" and the initials "TH" stomped out in elephant grass some 200 miles north of the crash site. No matter how the numbers and letters are examined, experts believe they can only be connected with the crew of Spectre 17, and almost certainly belong to Tom Hart. For example: the internal call sign and name of that aircraft was THOR. The only man aboard that aircraft with those initials was Tom Hart. Further, the #1 crew position on the AC130 and MC130 aircraft is the table navigator rather than the pilot - Tom Hart's position. The number "573" was on the crew compartment's window on the right side of that aircraft. The year was 1973 when the signal was made and photographed. That satellite photograph was later evaluated by other intelligence experts who stated that the letters were not stamped out in elephant grass, which would have indicated it was made by someone passing through the area. They determined those letters and numbers were made by planting Manioc plants to form the signal, which shows permanency. F rom 1981 to 1984, the Special Forces Detachment in Korea was charged by President Reagan with the responsibility of collecting live POW information throughout Southeast Asia. "SFDK" was commanded by Major Mark Smith, he himself a returned POW from the Vietnam War. Through his efforts, and those of team Intelligence Sergeant Mel McIntire, an agent net of 50 agents was established, specifically in Laos. The result of this intelligence net resulted in Major Smith compiling a list of some 26 American POWs by name and captivity location, with Thomas T. Hart III and George D. Macdonald being two of them. SFDK collected information that indicated other members of this aircrew were also alive, although that data was not as conclusive as the information on Hart and Macdonald. In April 1984, Major Smith received a message from one of his agents specifying that on 11 May three US Prisoners of War would be brought to a given location on the Lao/Thai border. The only prerequisite was that an American be on the Thailand side of the border to receive the men. When this information was reported up his chain of command, Major Smith's team was ordered not to leave Korea, to destroy all documents pertaining to LIVE POWs and they were sent back to the United States 6 months early. This documented information was provided to the United States Senate Veterans Affairs Committee in sworn testimony on 28 January 1986. In September 1982, 10 years after the crash, a private sector delegation of family members were allowed to visit the crash site unofficially. They did not know ahead of time if they would be allowed to go to a crash site, or which one. Ironically, Tom Hart's wife was part of this delegation. This site is extremely difficult to reach unlike literally dozens of other crash sites in the immediate area. Once there, they confirmed through first-hand observation the vegetation was visibly thinner than in the surrounding jungle consistent with a glide-path landing. There was no crater which would be expected if the flight path had been steep. There were two small depressions consistent with the location of the engines. Between the 2 depressions was a shallow "trench-like depression" which was consistent with the aircraft fuselage. In February, 1985, a joint US/Lao excavation of the AC130A crash site was conducted. A large number of small bone fragments and a few teeth, which had obviously been subjected to intense heat and with a total weight of only 6 pounds, were found. A 4 1/2 month examination of these bones and teeth resulted in the US Government's Central Identification Laboratory in Hawaii (CIL-HI) reporting the "positive identification" of remains for all 13 crew members still missing. None of the bones or teeth were attributed to the missing portion of Captain Birch. The Hart, Macdonald and Fuller families had an independent study of their men's remains done by a Board Certified Forensic Anthropologist. He stated, "I am able to conclude that it is scientifically impossible to identify said bone fragments as the mortal remains of any individual." Later investigation of the CIL revealed that eleven of the thirteen positive identifications could not have been made scientifically. In January 1987, because of Civil Court action, the Defense Department rescinded the identification of Tom Hart's and George Macdonald's remains. Other families of this crew sought the Court's assistance in fighting this travesty, however, officially the USG considers all 13 men to be "accounted for." Did the remaining 13 crewmen aboard Spectre 17 have their remains recovered and identified or are they still among nearly 600 Americans who disappeared in Laos and remain unaccounted for? Many of these men were known to be alive on the ground. The Laotians admitted holding "tens of tens" of American Prisoners of War, but these men were never negotiated for either by direct negotiation between our countries or through the Paris Peace Accords that ended the War in Vietnam since Laos was not a party to that agreement. Since the end of the Vietnam War well over 21,000 reports of American prisoners, missing and otherwise unaccounted for have been received by our government. Many of these reports document LIVE America Prisoners of War remaining captive throughout Southeast Asia TODAY. Pilots and aircrews were called upon to fly in many dangerous circumstances, and they were prepared to be wounded, killed or captured. It probably never occurred to them that they could be abandoned by the country they so proudly served. While the USG considers Tom Hart and George Macdonald, as well as James Fuller, to be "remains returned," their families do not. They ask that Americans continue to wear their men's POW/MIA bracelets and help them fight for an honorable accounting of them. Fred Fenter, or "Freddy", as most people called him, was my best buddy at Sunnyside High School in Tucson, Arizona. 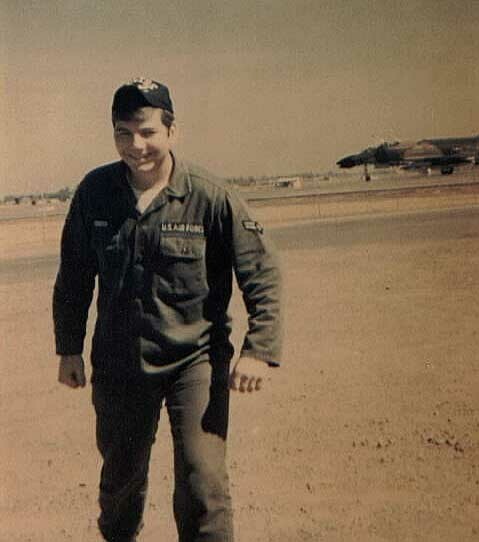 He always loved aircraft and joined the U.S. Air Force right out of high school in 1971.
en route to Vietnam from Ubon Air Force Base in Thailand where he was stationed. This is where you see him standing in the picture above. He was listed as missing in action for 13 years when, in 1985, his remains along with the remains of other crew members were recovered from the crash site in Laos by a Laotian excavation team. Although Fred was an Airman First Class at the time his plane was shot down, he progressed to the rank of Master Sergeant during his 13 years of missing in action status. 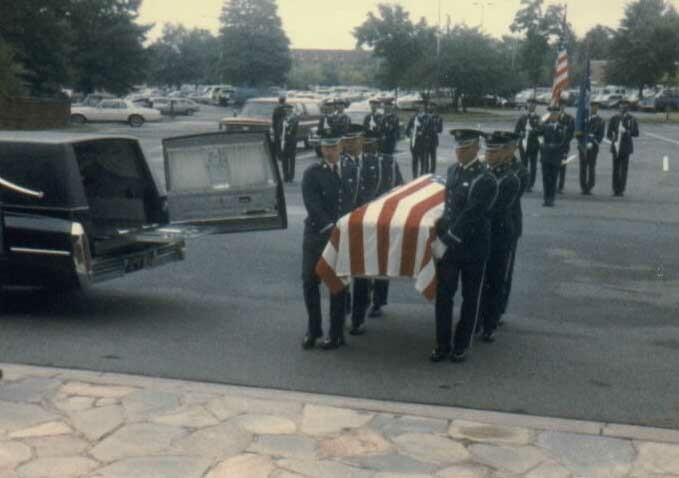 His mother, Mattie Fenter, requested that Freddy be buried at Arlington National Cemetery. And he was, with full military honors. A memorial service was held in Tucson 2 weeks later. Fred was well-liked by all who knew him. He was honest, hard working, and always there to lend a hand to those in need. He always laughed raucously at the cartoon satires that I drew about certain high school teachers, and about co-workers at Sandy's Restaurant where we both worked during our last year of high school. I also good-naturedly lampooned him in many of my strips. He laughed at those the hardest. He was always a good sport about it. I am working on a comic strip concept right now which will feature Fred as a main character. Fred was the closest thing I had to a brother. He will be missed always.